Link is a very powerful character who's melee attacks are definitely the highlight of his arsenal. Using his button attacks are a very wise idea as he can do tremendous amounts of damage with them. Link cross slashes twice, then stabs. Continuing pressing the A button makes Link stab repeatively. Propels sword out forward as in a thrust. It is pretty fast for a move of Link's, and it can usually KO at about 150%. It is a dependable combo finisher, but there is noticable end-lag. A quick upwards slash. Can juggle opponents and is a good combo move, especially when combined with his f-tilt and neutrual aerial. Depending on the direction LInk faces, there is a noticeable arch. Is a reliable kill move above 200%. Much different in the Japanese version, dealing 4% more damage (14% total) and can sheild break. A slow downwards slash. Pure, vertical knockback. Can combo quite well at lower percentages, being able to lead into his f-smash, forward tilt, and even potentially his grab. At higher damage, this move launches the foe so high, it isn't a reliable combo move. A simple overhead chop. Quite sluggish for an f-tilt, but also is very strong and highly damaging compared to other f-tilts. Link does a 3 move combo hit that if your opponent is on you or right next to you, will hit them 3 times with the last hit sending them to the air. Best saved for heavyweights and fast-fallers. This is a rather weak move compared to other smash attacks, but conversley, it is a decent combo move, able to flow into his up air, itself, an aerial, a Spin Attack, or simply a bomb. The range is rather poor, though. One of Link's few speedy moves, he slashes on both sides of himself. Great defensive move, though can KO at reasonaable percents too. When hit at the blade, the foe is hit in a 45 degree angle. Spins sword around above him then slashing vertically down in front of him. Good finisher, and one of Link's primary edgeguarding moves. An aerial kick. A defensive move, due to the fact it has little Ko potential even when hit at the start. Also a great edgeguard, and semi-decent combo move. Thrusts sword up. Above average KO potential, can also juggle. Due to it's high hitbox, it's best saved for foes on platforms above Link. Thrusts sword down. His primary edgeguard along with f-smash, it has very high KO potential, and deals a whopping 16% damage (ptentially 32%, as yu can hit twice with the move. You can use this baby to edgeguard, as noted before, but, unless the bounce lets you return to the stage, it's unsafe due to Link's horrible recovery. You can fasten the move's falling by pressing down, but for obvious reasons, don't do it near the ledge or offstage. Also has noticeable end-lag. Great combo finisher. A strong sword slash in front, then flips around and preforms an even stronger slash. While it's virtually impossible to combine the two blows, both can be used as cmbo finishers. Kicks behind him with both legs, left, then right. Decent kill power, but the hitbox is quite awkward, and is generally unsafe for edgeguards due to the length. 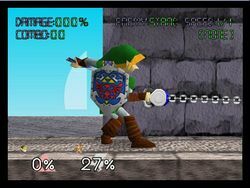 Link throws a projectile that returns to him, so it can damage an opponent twice in one throw. During the motion of taking out the boomerang, press or to adjust the angle of throwing it. An invaluable combo tool, due to the hitstun, and a great edgeguarder. Link performs a circular attack with his sword. You can use it to propel yourself upward when in mid-air. This is the payoff for Link being so strong as this attack is probably the propelling attack that propells you the least furthest. This is the big reason why he's in the bottom tier, as almost all the cast can easily combo him offstage from 0%, and edgeguard him quite effortlessely as well. It is a very powerful move, however, especially on the ground. Link pulls out a bomb to throw. Usually does between 5-10% damage and leaves opponent temporarily stunned. Other characters can pick it up if lying on the floor like an item. This page was last edited on 27 November 2015, at 23:18.